Our current work in the Port Lands evolved from a plan to revitalize the Lower Don Lands that was initiated in 2005. This 125-hectare area runs from the Parliament Street Slip East to the Don Roadway and from the southern boundary of the rail corridor to the Ship Channel. The naturalization and re-routing of the Don River mouth was the centerpiece for the Lower Don Lands. The project also included a precinct plan for the Keating Channel neighbourhood (bordered by the Keating Channel to the south and Lake Shore Boulevard to the north) which was endorsed by Toronto City Council in 2010. This initial planning work tackled a wide range of issues such as: flood protection, infrastructure, urban design, parks and waterfront promenade and transportation. The Lower Don Lands, which includes the Keating Channel and Villiers Island neighbourhoods, is one of the founding projects of the C40-Climate Positive Development Program. This program supports projects that seek to meet a “climate positive” emissions target of net-negative operational greenhouse gas (GHG) emissions. In 2007, we launched an international design competition to find landscape architects who could create a unifying vision for an integrated, green and sustainable community. This idea of a “complete community” provided the common ground needed to bring together ongoing initiatives in the area, including: The Don Mouth Naturalization and Port Lands Flood Protection Environmental Assessment (DMNP EA), Lower Don Lands Framework Plan and the Lower Don Lands Environmental Assessment Master Plan. In May 2007, Michael Van Valkenburgh Associates’ (MVVA) proposal was announced as the winning design, which set the framework for what would become the preferred alternative in the DMNP EA. 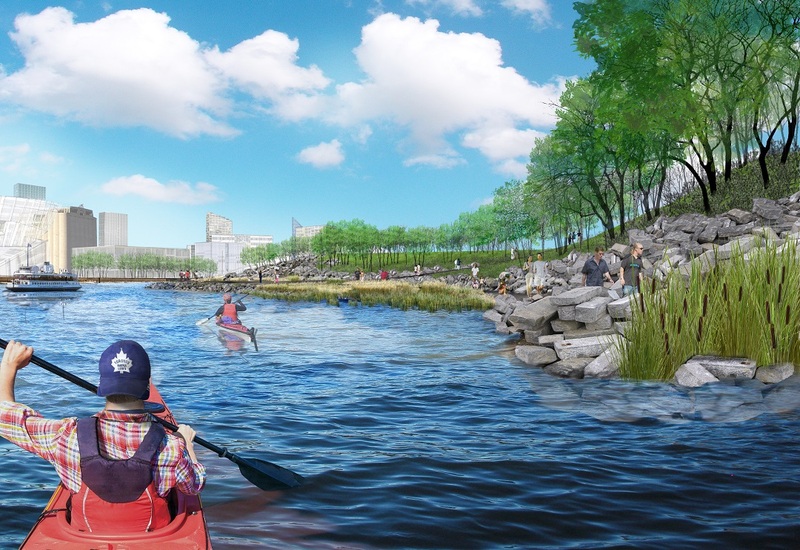 Throughout this process, Waterfront Toronto, the City of Toronto, and Toronto and Region Conservation (TRCA) hosted many community consultations on the design for a re-naturalized mouth of the Don River. Find the summary of all consultations related to the DMNP EA here. Artist Rendering Looking Northwest at the Naturalized River Mouth.